The lovely players and viewers at LOTROstream sent us a gift in honor of Mordor being released, and we're floored. Click here to see it! The annual Department of Holbyt Security "Take the Hobbit to Isengard" run was a success! Click here for the archive. Sound-of-the-Movies recently talked to Chance Thomas about making music for LOTRO and more! Click here for the interview. 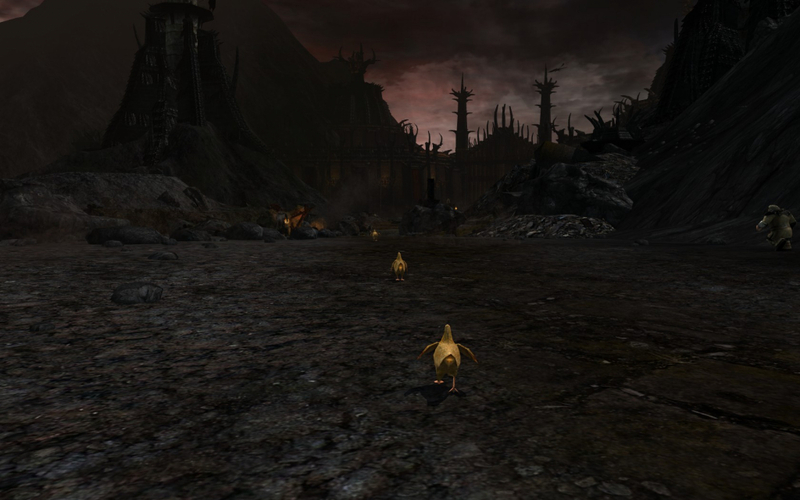 Crickhollow will be host to a Chicken Run to Minas Tirith event on August 19th! Click here for more info. Bards, Beers, and Longbeards play every Saturday around Midnight Eastern outside of the Prancing Pony on Landroval! You can learn more about this self described "ridiculous concept band" here! The Pie Shop Lads (and Lassies) wrap up their summer tour on August 8th in Hobbiton! Click here for more info on this event on Laurelin. Circle of the Silver Swords are a Laurelin-based Kinship with all types of players, from Role Players to Raiders to PvMPers to casual gamers. This world-wide roster might be for you! Click here to check out their web site. What is the first item you try to get on each character you make? LOTRO Players News records just before the Mordor launch. Click here for their newest show! Light the Beacons creates a top ten in his newest show! Click here to get it. LOTRO Academy reviews Volume 2! Click here to hear it. Coily quests on his elven guardian in the latest Coily's Adventures! Click here to watch it. Oculos Nerd checks out the Glinghant instances. Click here for the video! GameolioDan tackles Falco's Garden! Click here for his Let's Play. Zogog finds the Standing Stone! Click here for Scavenger Hunt fun. xEv1LTw1Nx streams on LOTROstream on Thursdays, but can be found throughout the week! Click here to Subscribe to his Twitch channel! Update 21: Mordor has been released! Click here to purchase our new expansion! Our Mordor FAQ answers many of your questions. Click here to read it! The Release Notes for Update 21 have been published. Click here to get them. LOTROstreamers are in Mordor! Click here and Follow our channel! Made of Lions looks at the Epic Story! Click here for more. Hologro and friends successfully led their chickens through a most dangerous journey on July 30th. This is one of several great screenshots, the rest of which can be found here. LOTRO Bonus Days bring you Hobnanigans! Now through August 6th. The Weekly Coupon Gets you a free +5 Attack Damage x1 with the Coupon Code MORHURT, now through August 10th!